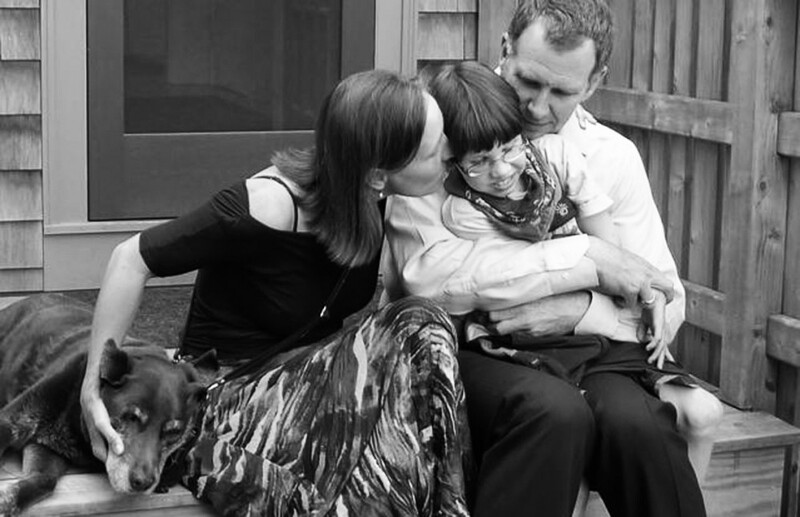 A POWERFUL TALE: Shake sits with husband Kolster and son Calvin, a sufferer of epilepsy. On her birthday one chilly fall morning in 2010, Christy Shake woke up and decided to write a daily blog about her son Calvin’s ongoing battle with epilepsy. She wasn’t sure exactly what she was going to write at the beginning, but she just “knew it was something [she] had to do.” Nearly two years later, Shake’s blog, titled “Calvin’s Story,” has received more than 155,000 hits. Shake and Professor of Photography Mike Kolster’s eight-year-old son, Calvin, was born six weeks premature and suffers from epilepsy. Since his diagnosis at the age of two, Calvin’s quality of life has been compromised by frequent seizures and the negative side-effects of medications that are necessary to combat the disease. In light of her son’s struggle, Shake decided to make it her life’s work to tell Calvin’s story and raise awareness about epilepsy. There are copious misconceptions about epilepsy, according to Shake. “People don’t admit that they have [epilepsy] due to stigma, and as a result it is a very poorly represented disorder,” she said. Shake added that in the past, it was thought that those with epilepsy were contagious. Individuals with epilepsy had difficulty obtaining employment and, in periods of heightened prejudice, were not permitted to marry. One of the most important myths that Shake tries to dispel is the misconception that seizures can be stopped by taking preventative drugs. “You can’t live with them, you can’t live without them,” Shake said of the drugs. Without medication, Calvin would be more susceptible to fatal seizures, but the constant dosages take a toll. Shake recalled a particularly scary incident, when Calvin had a 45-minute grand mal seizure and his parents did not think he would survive. “We were basically kissing him goodbye,” she said. Calvin survived, but the emergency medications that he was administered during the attack did not expedite his recovery. If it weren’t for his medication, Calvin might be able to walk without the assistance of a harness or a hand. He wouldn’t be prone to drooling. And he might to able to talk. “Other parents say how quickly their kids are growing up; for me, it often feels the opposite,” said Shake. One of Shake’s recent blog posts featured “Soft Watch at the Moment of First Explosion,” by Salvador Dali. This painting represents the “elastic time” that rules Calvin’s life—time that seems to stand still during Calvin’s seizures—as well as his stunted cerebral developments caused by the drugs that keep him alive. To help achieve this goal, Shake started hosting a February benefit four years ago, which she said, “started out small, just some friends over for cocktails and food at our house.” Three years later, the benefit had grown so much in size that it had to be relocated to Cram Alumni House on Federal Street. Shake said that she has considered moving the fundraiser to Portland, but that the Brunswick community has caused her to hesitate. His admiration of his wife’s efforts to raise funds and spread epilepsy awareness is clear. “She’s just so good at communicating,” said Kolster. “She’s really good at telling people how things are, and how they feel,” Kolster said. With over 1,500 addresses on her blog’s email list, Shake seems well on her way to completing her mission. For more information about Calvin’s story visit calvinsstory.com. Donations to CURE in Calvin’s name can be made at calvinscure.com. For most first years, college presents an opportunity for a fresh start among strangers. Most first years do not start college with millions of hits on YouTube. Nicole Tan, or “uuuuuuuukewithme” on YouTube, has gained 5,280,969 views for her acoustic cover of the song “Super Bass” by Nicki Minaj. Tan is a prime example of talent converging with social media. She said watching YouTube videos sparked her interest in performing covers. When President Obama recalled meeting inspiring Americans in his address at the Democratic National Convention last Thursday, Samantha Garvey '16 had no idea she would be mentioned. Garvey met Obama last January when she was named a semifinalist in the Intel Science Talent Search, one of the country’s most prestigious science competitions for high school students, for her research on the defense mechanisms of mussels.